The third round of talks in Astana, sponsored by government ally Russia and rebel backer Turkey, is scheduled to begin on Tuesday. BEIRUT: Syrian rebel factions will not attend a new round of negotiations with government figures in the Kazakh capital, an opposition delegation spokesman told AFP on Monday. "Rebel groups have decided not to participate in Astana," said Osama Abu Zeid, saying one reason for the boycott was "unfulfilled pledges related to the cessation of hostilities." The Astana track has aimed to reinforce a fragile ceasefire deal brokered by Moscow and Ankara in December. "We decided not to participate in Astana because the reinforcement of the ceasefire was not implemented," said Ahmad Othman, commander of the Ankara-backed Sultan Murad rebel group. 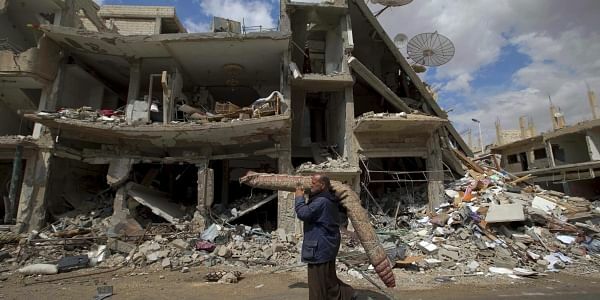 "The regime and the militias are continuing to bomb, displace, and besiege," he told AFP on Monday, saying rebel groups had informed the talks' sponsors of their decision. According to Syrian daily Al-Watan, which is close to the government, the regime's delegation was scheduled to arrive in Astana on Monday. The delegation will be headed once again by Syria's representative to the UN Bashar al-Jaafari, who has also led the government's representatives in parallel UN-backed talks in Geneva. A fresh round of negotiations in Switzerland is set to begin on March 23 and will focus on governance, constitutional process, elections, counter-terrorism and possibly reconstruction.